Cream of Broccoli and Pistachio Soup is a delicious dairy free alternative to the classic broccoli soup, and it takes only 20 minutes from start to finish. A great vegan or vegetarian weeknight meal the whole family can enjoy. I know, I know, Cream of Broccoli and Pistachio Soup sounds like something out of an episode of Portlandia (if you haven’t witnessed the hilariousness that is Portlandia then jump on that bandwagon now!). Cream of Broccoli and Pistachio Soup….what? Bear with me, this is some seriously good stuff. I have a two-year old, who despite my best efforts, is going through the ‘I don’t eat green’ phase. This is an extremely, EXTREMELY annoying phase. Only slightly better than the ‘I never sleep‘ phase. I swear, I can give her a mouthful of food, and she can eject the tiniest speck of green faster than I can swallow my sneaky chocolate when I hear her coming down the hall. Pretty bloody fast! So, giving her a whole bowl of green…hmmmm, that’s just asking for a whole bowl of green on the floor right? Not so, she ate the whole bloody thing! My smaller person danced as he ate the soup! However, given his tendency to dance and eat anything set in front of him, he will not be used as an example for this particular scenario. We will not be using his dance routine as an indication of anything other than his thought process of ‘there is food, let us dance’. Now, I will admit, the pistachios mixed in with the broccoli was a complete accident. Genius, but an accident nonetheless. 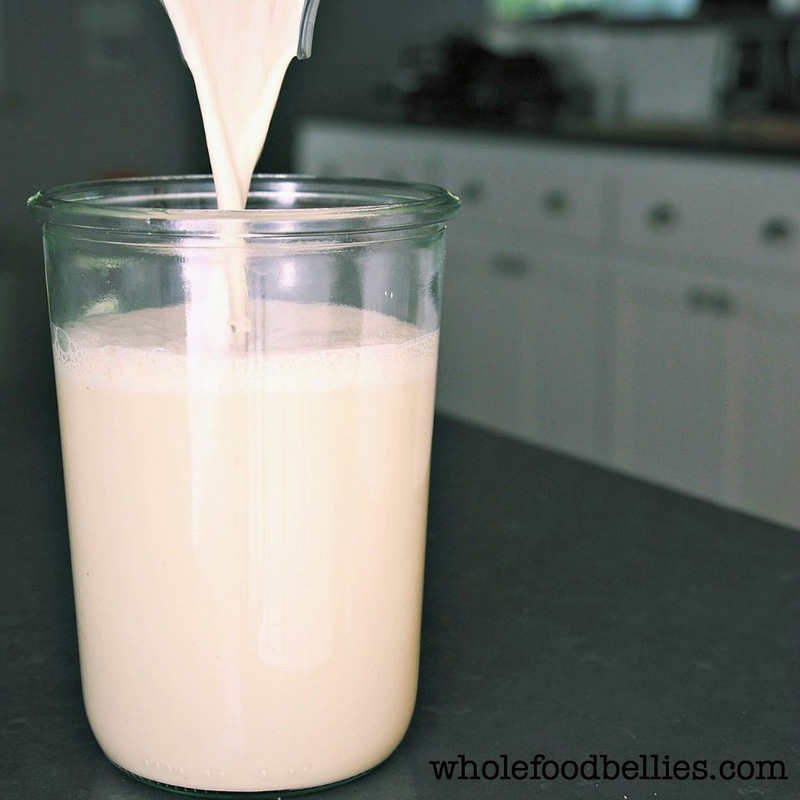 I had no milk, no inclination to go to the store to buy milk, and no time to soak nuts for making my own nut-milk. 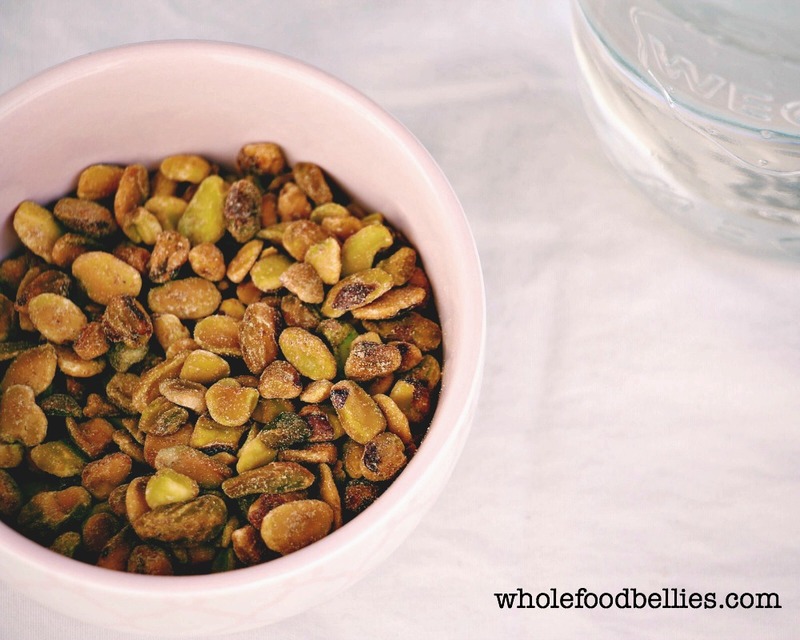 In walks pistachio – no soak, no strain, boom! So freakin’ creamy! Back to Portlandia. Seriously, watch that show! If you are anything like me, you will pretty much hate the first episode, but be weirdly intrigued to keep watching. Mainly because it is hands down the weirdest thing to EVER be on television. period. BUT, travel to Portland, and then watch it again – Oh Ma Gah so funny! Even if you don’t want to watch the show, you still have to travel to Portland at least once in your life. The place is awesome; the food is amazing, they have a book store the size of an entire block, the food is amazing (yes, I know that’s there twice, but it deserves to be). Basically, if it didn’t rain so much it would be my favourite place in the entire world and I would be moving there tomorrow. But the rain….you know. I grew up in Belfast, I don’t need that kinda weather again. I just love to hear from you so if you try out this delicious Cream of Broccoli and Pistachio Soup make sure to let me know how it goes! Happy eating. 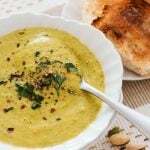 Cream of Broccoli and Pistachio Soup is a delicious dairy free alternative to a classic soup which takes only 20 minutes from start to finish. A great vegan or vegetarian weeknight meal the whole family can enjoy. Freezes well. Just pop 1 or 2 cup servings into glass jars or ziplock bags and pop into the freezer. Don’t ya just hate those people that don’t like soup!! My daughter is one of these people too, so my solution is to make ALL the soups and hope one catches 🙂 Love the sound of your additions!! Fingers crossed she loves it for you!! I’m game to try this. We love soups! I definitely would have never to thought to use pistachios, but it looks great! This soup looks fantastic and creamy and delicious! I know right? Such a weird show but I can’t look away! Sometimes the weirdest combinations are the best ones!! Sounds delish!! Don’t you love toddlers and their fussy eating habits!! What an interesting combination! I’m totally going to make this on Saturday 🙂 Thanks for sharing! You are so welcome Sara! Hope you enjoy! wow! I never thought of adding pistachios to a soup! sounds great! Neither had I, until I had to out of laziness 🙂 It worked great so I am going with it!! I love the idea of pistachios in cream of broccoli soup! I am going to try this recipe out as soon as I can!!! Thanks for sharing the great recipe! Maybe I will watch Portlandia AS I make the soup..hmhm good idea! This looks so good! I love cream soups! I’d love to try this out sometime. I hope you do Jessica! What a creative and delicious looking idea!